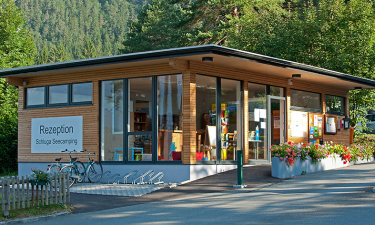 In the summer, Schluga Camping Hermagor is close to hiking and biking trails through scenic valleys and mountains. Hermagor’s alpine wonderland is also popular during the winter and this luxury camping site is close to great skiing. Regardless of when you visit, the well-equipped campground is a fabulous base for experiencing this beautiful region of Austria. 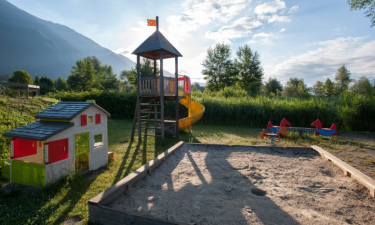 Situated in Carinthia, the campground sits between the Carnic and Gail Valley mountains. With stunning mountain views, the luxury camping site covers an area of 5.5 hectares. There is plenty to do at Camping Hermagor with a football pitch, cinema, petting zoo, television lounge, and much more. Book your mobile home today with LuxCamp and get ready for a thrilling camping holiday! Why Choose Schluga Camping Hermagor? Comforts you expect from a luxury camping site are provided at this full-service destination, including a superb restaurant. There is a modern fitness centre plus four blocks with heated showers, lockers, drying rooms for tents and ski equipment, and dog showers. Convenient laundry and dishwashing facilities are available as well as Internet access. A striking stainless-steel pool is an idyllic space to enjoy the outdoors and cool down. 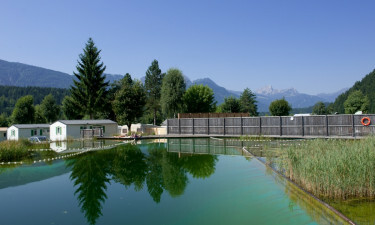 There is also a freshwater pool for a more genuine swimming experience close to nature. A kids’ splash pool also offers a safe and fun space for little campers to enjoy the water. 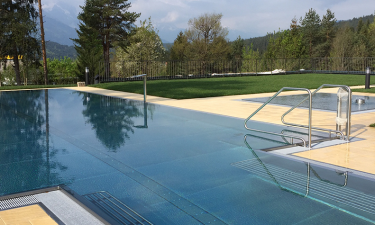 Grassy areas around the outdoor pool offer a relaxing spot to appreciate panoramic views of dramatic mountain ranges. You can recharge at saunas and massage rooms within the camp’s luxurious spa. The spa area also has its own indoor pool, where you can enjoy a swim regardless of what the weather is like outside.